Whether we ease our minds by just looking across the street at it, eat lunch there, or enjoy its latest art installation, Madison Square Park is an indispensable part of our life in NoMad. In fact, it it is hard to imagine how things would be if it were not there. Luckily, our forebears recognized the important respite a green space provides, and caring generations over the past 150 years have delivered this magical place to us. The park becomes even more rewarding if we are mindful of all that has happened there…and all it caused to happen there. So rich is its history that we can’t cover it in a single article, but let’s look at a few of the more significant highlights. It’s hard today to imagine NoMad as swampland, but when the Dutch first settled New Amsterdam at the lower tip of Manhattan in the early 1600s, that’s exactly what this area was. The land was undeveloped, with a swampy creek winding through it on its way to the East River. In 1686, several decades after Britain had taken over the colony and renamed it New York, the Royal Governor of New York designated this area a public hunting ground. Nearly two decades after the colonies declared their independence from Britain, a yellow fever epidemic swept through the mid-Atlantic region, starting in Philadelphia and making its way to New York City in the mid 1790s, killing thousands in its wake. When Bellevue Hospital needed a “potter’s field” for the dead, the relatively close old hunting grounds became the obvious choice. It is believed that some victims are still buried beneath the park’s soil, although most of the bodies were eventually moved to the Washington Square area. In 1807, the U.S. military set up a Parade Grounds of 238.7 acres in the area, on which to practice maneuvers—a function the land served through the War of 1812. Shortly after the war, in the face of increasing population demands, the public land was reduced from 238.7 acres to 89.2 acres and named Madison Square after President James Madison. Nearly 20 years later, the old military arsenal on the grounds was converted to serve as the nation’s first home for juvenile delinquents. In 1844, again in response to NYC’s rapid expansion, Madison Square Park was reduced to 6.2 acres, the park’s current size. Shortly after, park planners officially opened the park as a public city space. Originally, the park was laid out in street-grid fashion similar to the streets around it, but in the 1870s, park designers Ignatz Pilat and William Grant redesigned the park with winding, curved walkways, deliberately avoiding any direct route across the grounds. This meandering style formed the basis for how the park looks today and is largely responsible for the park’s sense of seclusion from the surrounding city. During the Gilded Age, Madison Square Park would become the centerpiece of the neighborhood growing around it. The wealthiest New Yorkers lived in brownstones around the park, and nearby restaurants and hotels became popular hangouts for artists, writers, politicians, and celebrities. In the early part of the 20th Century the park became the place where the city came together for all sorts of events: to view election results projected on nearby buildings, demonstrate against injustices (including the famous Rocking Chair Riots instigated by a St. James tenant, watch parades honoring national heroes, hear speeches, and even the relish the lighting of the city’s first and largest community Christmas tree (the forerunner of the Rockefeller Center tree). In the 1960s, the future of the park was briefly threatened when, in an attempt to accommodate increased automobile traffic, a proposal was put forward to build an underground parking garage beneath the park. Fearing that the new garage would damage the roots of the park’s many historic trees, opponents voiced their concerns loudly. The plan to build the parking garage was eventually scrapped. Whew! In the decades following the Gilded Age, the neighborhood surrounding Madison Square Park began to decline, falling into disrepair, and experiencing higher crime rates. By the 1970s, this neglect had made its way fully into the park itself, and it had become overgrown, dark and dangerous. 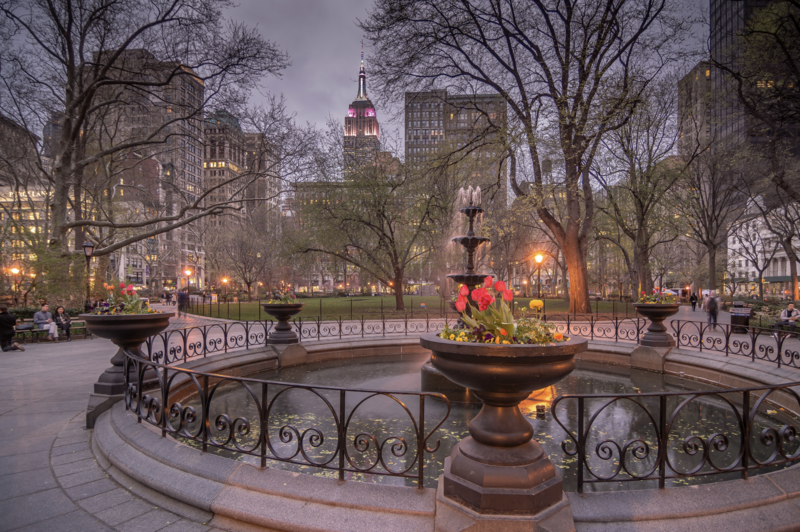 Fortunately, the park found a Good Samaritan in a former park official named Donald E. Simon, who in 1979 first began making unprecedented appeals for Madison Square Park to be supported through private funds. Neighborhood corporations the Metropolitan Life Insurance Company (Met Life) and New York Life were among the first to answer the call, initiating a 22-year process that would result in a phased restoration of the park, and eventually the formation of the Madison Square Park Conservancy—the nonprofit group that oversaw the completion of the park’s restoration and currently maintains the park through private donations. Today, residents and workers of the NoMad, Flatiron and Gramercy neighborhoods get to enjoy a well-maintained park offering green space, art installations, concerts, readings, children’s events and more. The renown of our tiny 6.2 acre gem has spread, because of the hard work of the Conservancy and the support of the committed community around it. And this work is allowing it to make more noteworthy history. Madison Square Park has been selected to represent the United States at the 58th Venice Biennale this summer with the work of Martin Puryear, who’s Big Bling the Conservancy presented in the park back in 2016. It seems the park has a great deal more history to write.